Thanksgiving is my favorite time to set the table with my collection of Booths Real Old Willow by Royal Daulton. I set a coffee service on the sideboard in the dining room early this year. It was a time saver with family coming the weekend before Thanksgiving. This year I added natural materials from the yard, and a Fairytale pumpkin hollowed out for the centerpiece. The pumpkin is a pale shade of pink so I added pink roses for a different look and I loved it! I decided to leave the table set to enjoy throughout the weekend. For the centerpiece I started with a moss covered runner down the center of the table. Gathering natural materials from my yard and using tiny salt and pepper animals created a natural look I was going for. 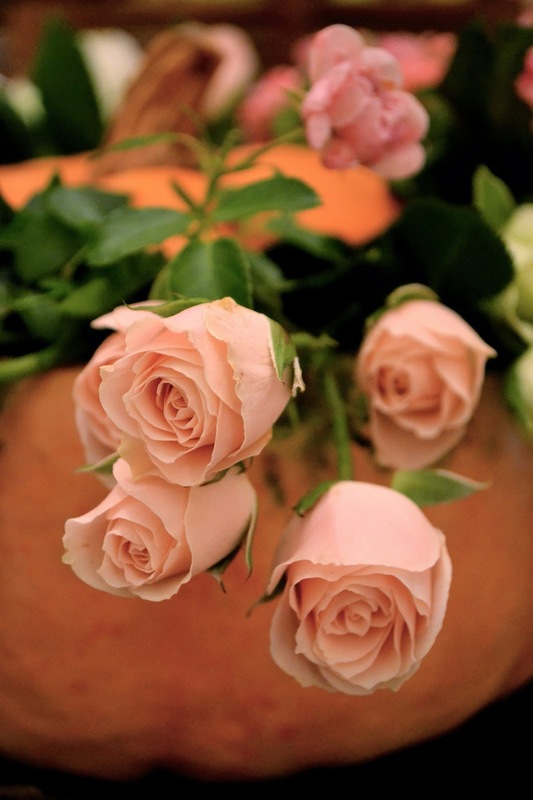 Scooping out the pumpkin and adding the roses, then placing the pumpkin lid back for a natural and finished look. In the kitchen on The French Hutch, dried flowers in a mug of favorite well wishes. Now that Thanksgiving has come and gone it’s time to think of Christmas decorating. I had a little project in mind for some fun with Connor! 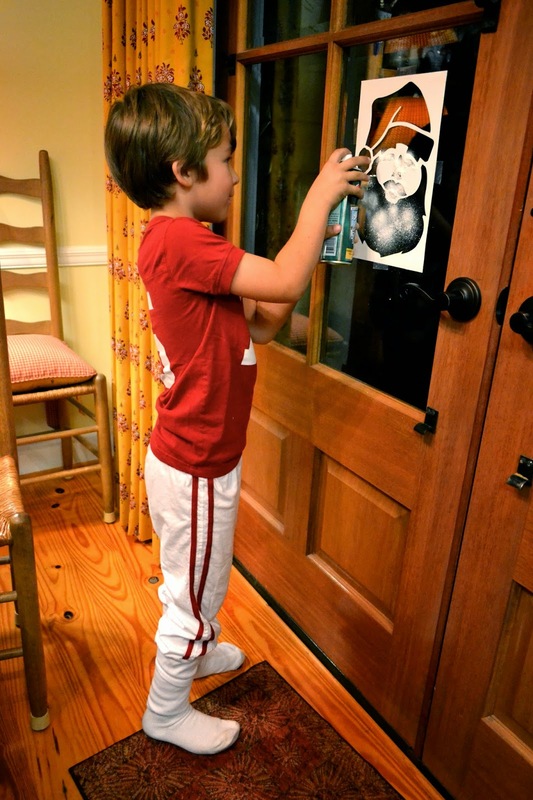 What little boy could resist spraying snow out of a can onto Bama’s windows! I remember doing this with my mom, sweet memories! Connor did a really good job for me. We were getting close to bed time and we didn’t have time for a lot of photos. Thank you for your visit, if you have time I would love for you to leave a comment so I will know you stopped in for a visit. Emily, your table and sideboard are so elegant! I'm crushing over your set of Booth's Real Old Willow. I remember first seeing it on one of Cherry Kay's tables. It is exquisite! 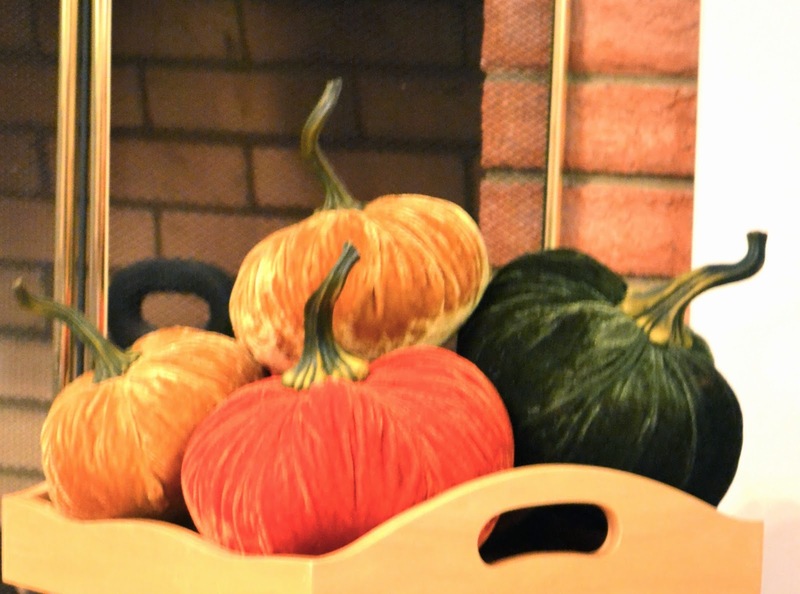 Your pumpkin centerpiece is too. What a lovely setting for a family gathering. Yes, I too remember using stencils for snowy windows. What a perfect activity for Connor. I know he had FUN! Thanks for sharing. Can't wait to see your Christmas decorations. I got our tree up this weekend and fluffing the rest of the house for the holidays. Ouh cette vaisselle extraordinaire associée aux teintes d'automne, j'aime beaucoup. Et très vite, entrons dans la magie de Noël, on y est ! Perfect in every way, my friend. 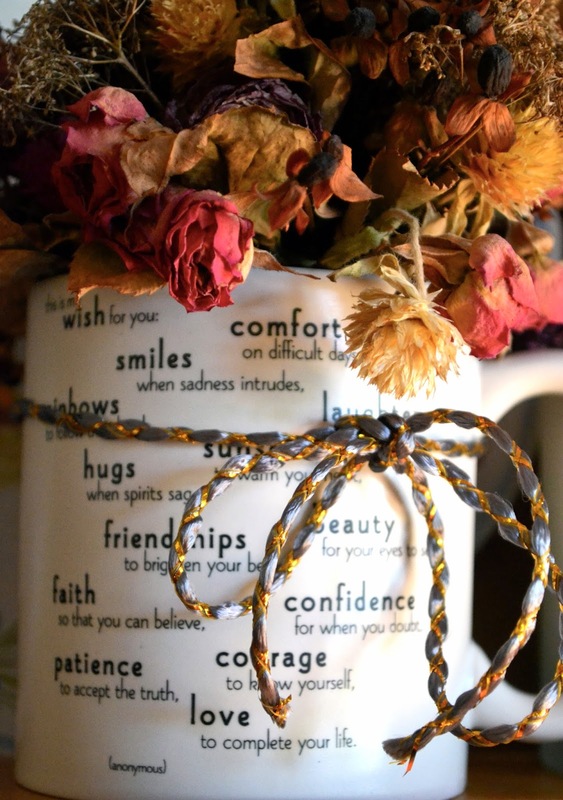 Love the color combination, and the wishes on your mug. Connor, of course, steals the show with his creative skills. What a great idea. That is such a classic and gorgeous pattern. You have a very nice collection too. Beautiful home. Hello Emily, I'm glad you've come to link with Mosaic Monday. 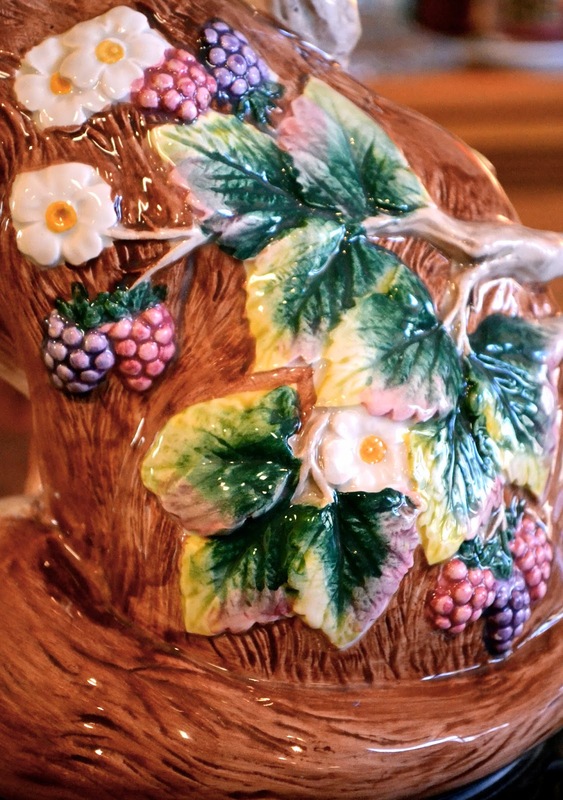 Your blue and white dishes are gorgeous and I love the fox pitcher. Oh, I do love your decorations! Your blue tableware is top notch! And Connor has the BEST grandma! Your set is royal. 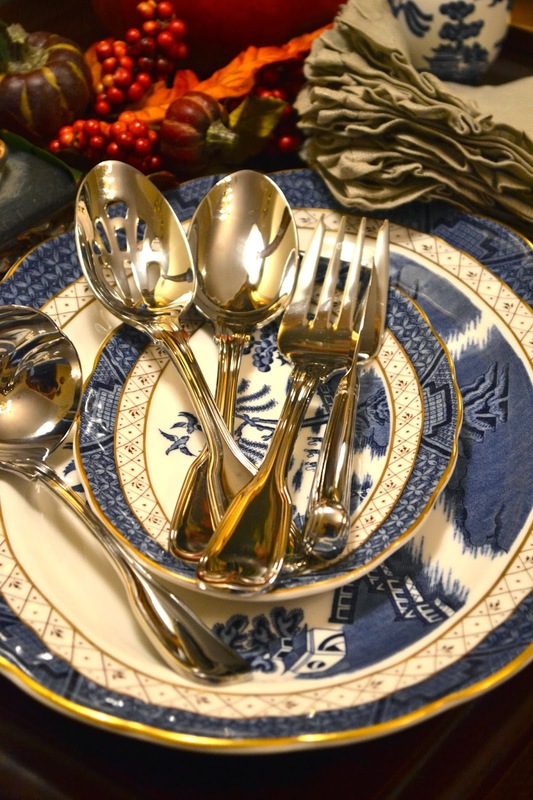 Every piece is an elegant addition to the whole table setting. 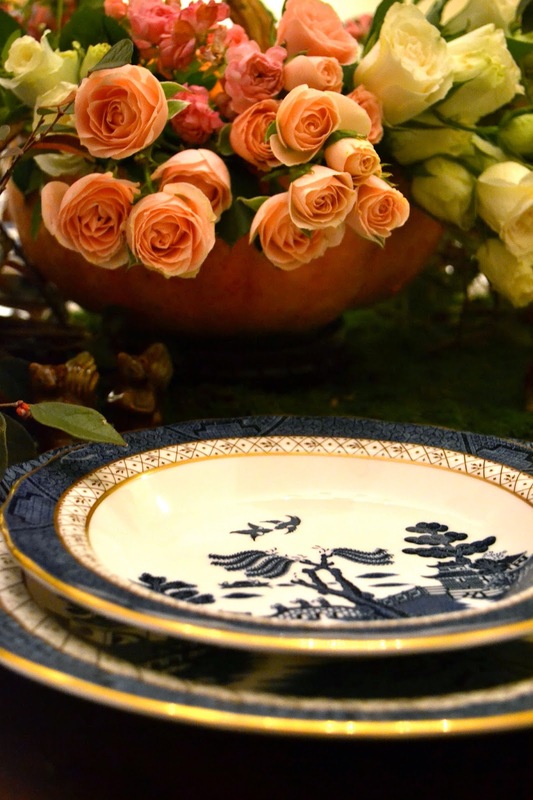 Yor china is beautiful and I can see why you love to decorate and set the table with it. Emily, what is not to love here? It's gorgeous -- the blue willow is fabulous; the table runner enchanting and I love the pink roses. Different and simply beautiful. A wonderful set up for the perfect holiday! And good job, Connor! Amazing! We had two of us for Thanksgiving - afraid my table was a far cry from your beautiful presentation. It is a beautiful post as well. Your blue willow collection is amazing! 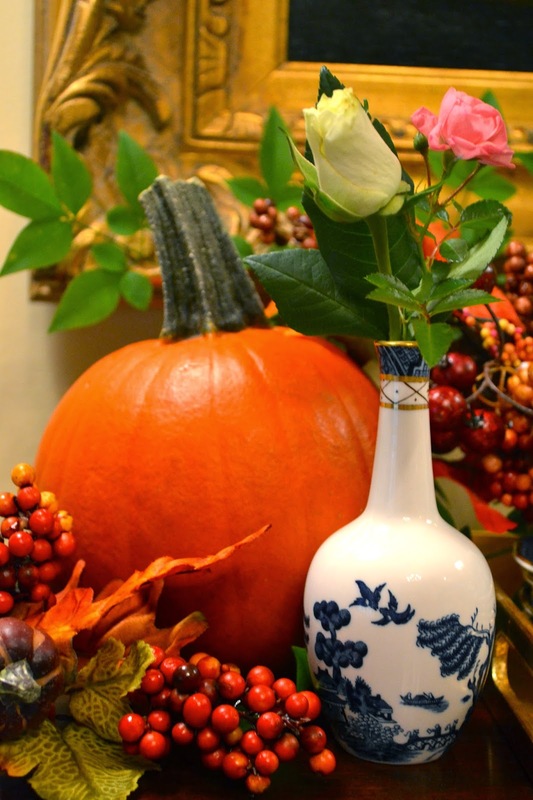 I love your elegant Thanksgiving table. 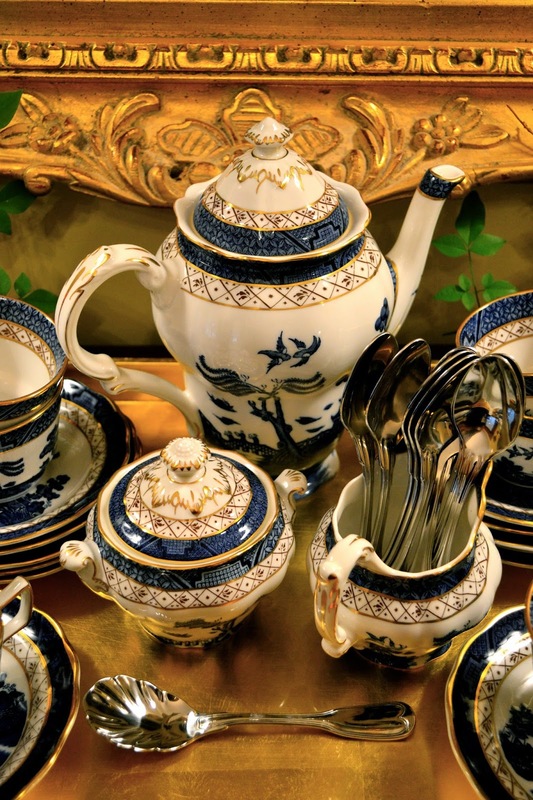 The china pattern is gorgeous! Blue Willow has always been a favorite of mine! 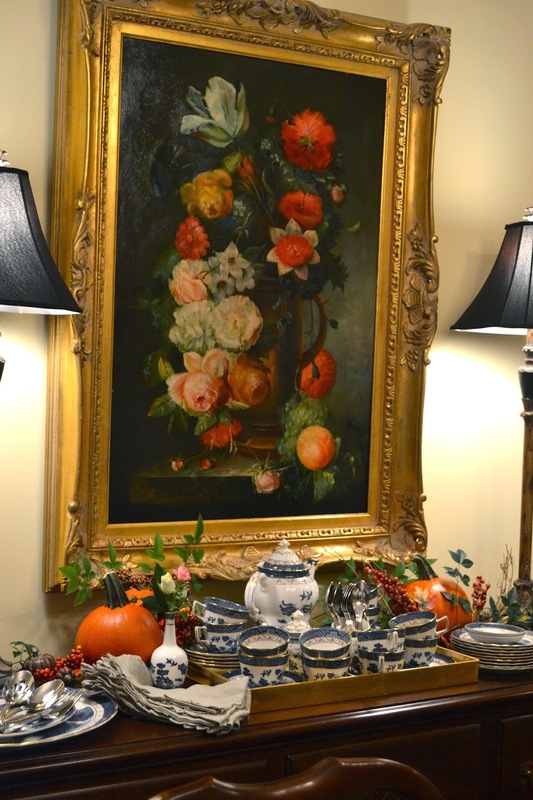 Emily, your sideboard and tablesetting are just beautiful! The china is stunning! Everything looks so lovely with all of the natural accents. You always have such beautiful settings. I hope to see your gorgeous Christmas decor soon. It is one of my faves! A boy and his spray can....what a wondrous sight!!! I remember doing this, and you're right...fond memories that are nice to be able to pass on! You set an absolutely lovely table for Thanksgiving, and I know your family - especially those who traveled in from afar - appreciated every single detail. I'm super impressed that you carved out that pumpkin for the centerpiece!!! The roses in it were so delicate and beautiful, and they looked great with the berries and greenery. I hope your Christmas decorating is just about finished now so that you can just kick back and enjoy it! Happy December to you and yours! I love your pretty Blue Willow and lovely settings! And Connor did a wonderful job decorating too! Enjoy your new week ahead! Everything looks beautiful, Emily. You always have the special touch for creating beauty. Absolutely lovely Thanksgiving decor. 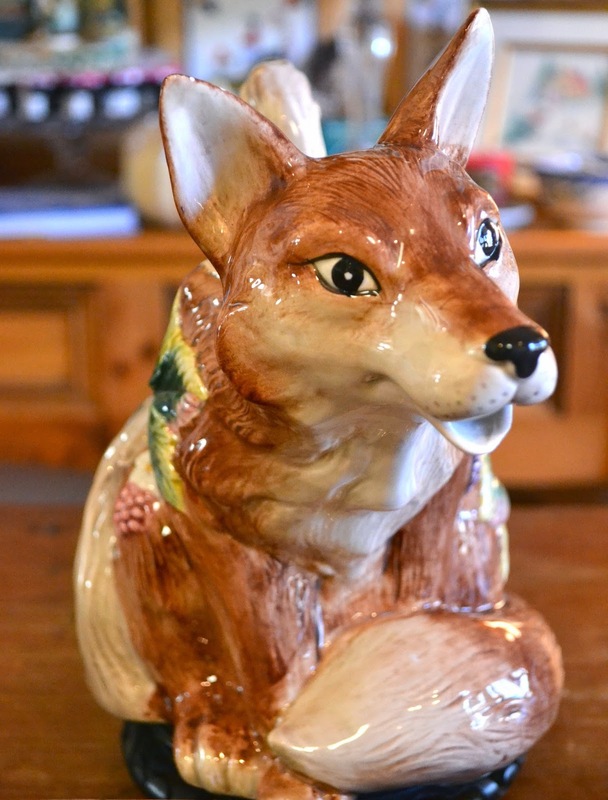 Your Blue Willow china is gorgeous and I'm especially fond of your little fox! I'd enjoy being a guest at your house for any holiday! So happy I found you at Cindy's Dwellings party. I love your Blue Willow china, Emily! I hope you had a wonderful Thanksgiving and that this Christmas season will be full of sweet happiness for you and your grandson. Connor did a very nice job with those stencils! I've never seen this version of the Blue Willow, and it is stunning! You always show the most gorgeous scenes!